The People of Peru were so cute and adorable! I loved the colorful clothing and most of them had smiles on their faces. 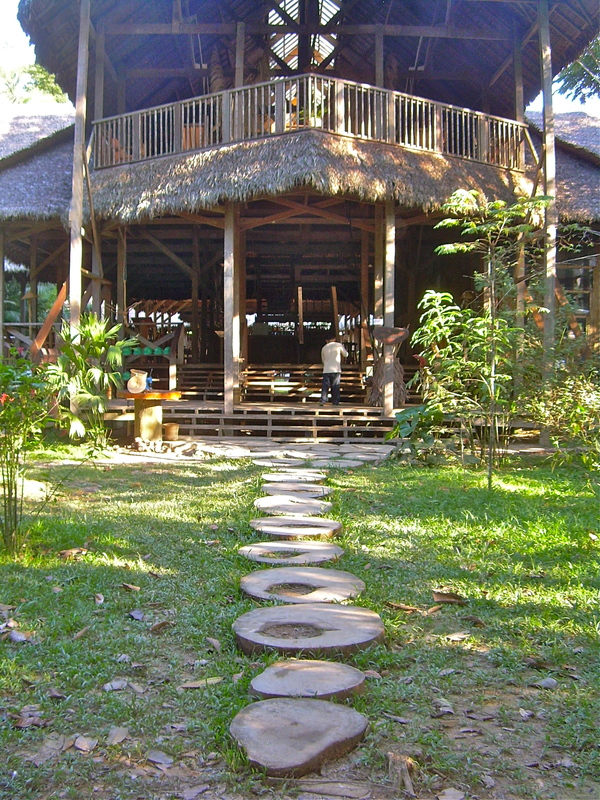 The last stop of my three week Peruvian adventure was the Tambopata Rainforest area off the Amazon. After boarding a short flight from Cuzco to Puerto Maldonado, the 11 of us on a GAP Adventures tour, took a motorized canoe to our lodge. The Lodge was much nicer than I expected! Hiking Machu Picchu is one of those “once in a lifetime” experiences and I enjoyed every moment of the three and 1/2 day, 27 mile hike! I was traveling with 10 other fellow adventurers on a G Adventures trip in May of 2009. 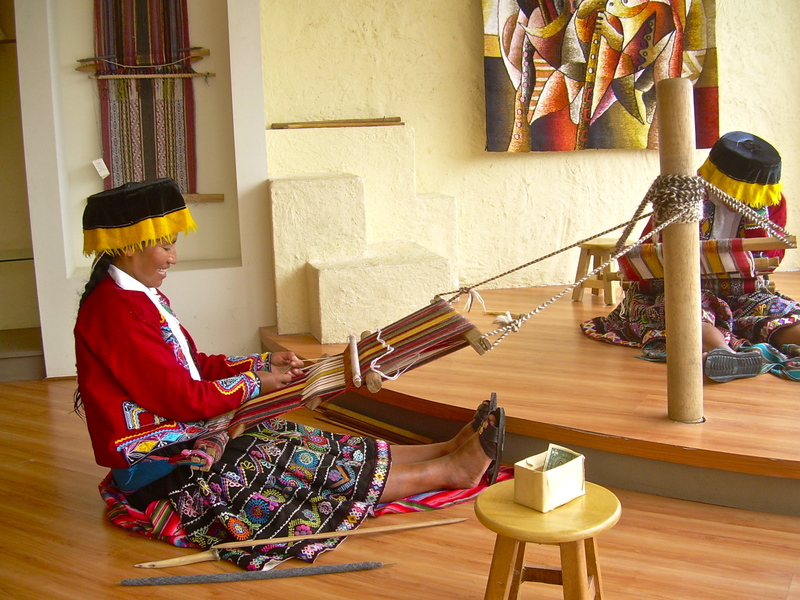 We had visited the absolutely breathtaking Lake Titicaca and were on an all day public bus ride to the beautiful and vibrant town of Cusco, which is located about thirty minutes by train to the start of the Inca Trail hike. Typically, we traveled by private van, but this trip was an exception. The road to Cusco from Lake Titicaca is very curvy and mountainous. Unfortunately for the other passengers, I had intestinal problems. The bus was swaying from side to side along the twisting roads and the restroom was small, dark, and void of toilet paper. I couldn’t avoid the imagined glares from passengers as I had to utilize the facilities a few times that day! For the previous two weeks, we had gradually risen in elevation within Peru, which is a good thing when you’re going to hike the Inca Trail. Altitude sickness can strike young, old, fit or not…so if you can acclimatize…all the better! Cusco reminded me of Europe. 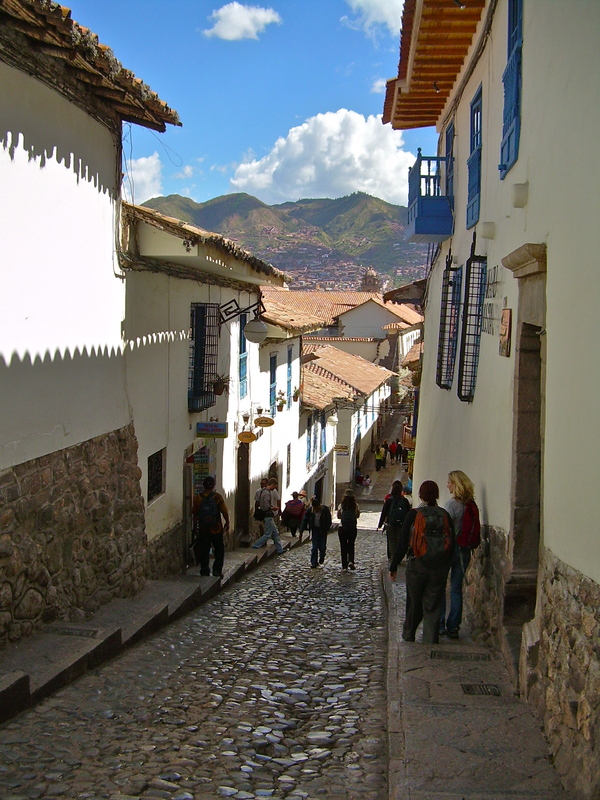 Cobblestones, narrow streets and history everywhere! In 2009 I decided to do some travel. If you’ve been reading along, you knew I went to Egypt and Jordan in early April. Peru was next…so after being home for 10 days, I flew into Lima, Peru by myself and arrived at my hotel about 11:00pm. For the next three weeks I would be exploring with 10 other travelers through GAP Adventures. To avoid paying the single supplement, GAP will pair you up with a roommate. My roommate was still awake when I arrived. She was a college student from the Northeast area of the U.S. The next morning I met the rest of my fellow travelers…a diverse group from New Zealand, Australia, Morocco, Gibraltar, Germany and two women from California. We only had a few hours to explore in Lima, so my roommate and I walked around, and got some street food. 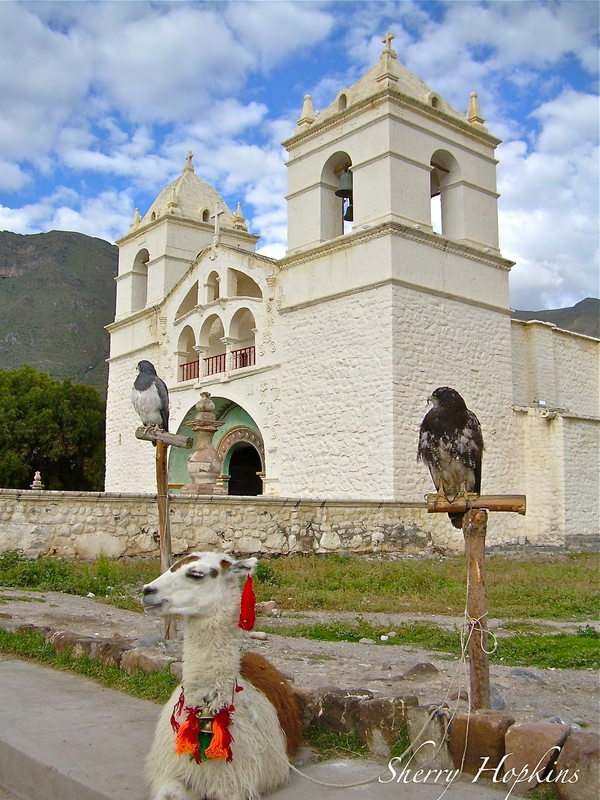 After the culture shock from Egypt…I was prepared, so Peru seemed tame. Like Egypt, many of the restrooms were simply a hole in the ground, with no toilet paper available, and you had the privilege of paying to use them! Please don’t think I’m complaining. I’m not your “prissy…pampered” type of woman. I love to camp and rough it! I’m just stating the facts. 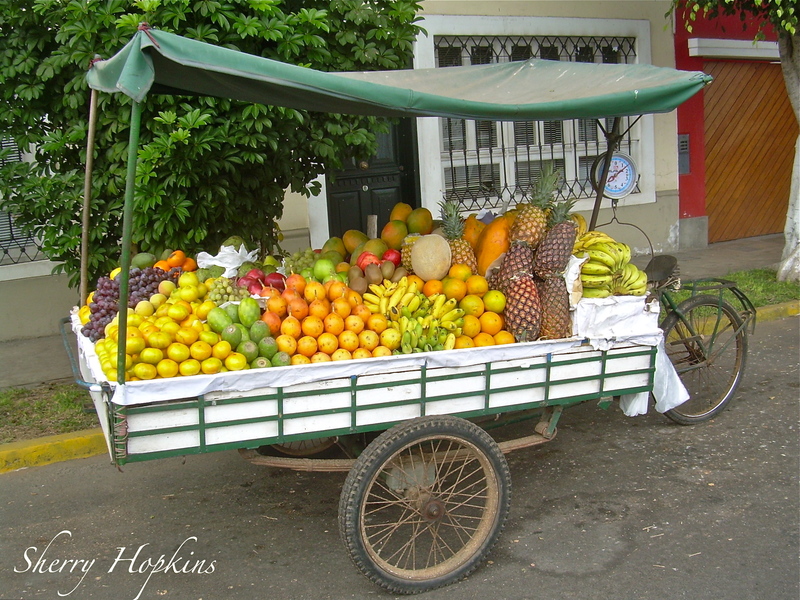 I loved this bicycle/wagon filled with fruit!